This is the second Target Beauty Box for October, which has goodies for skin, makeup, hair, and health items!! I can't wait to get started trying out this box so let's begin! Here is the card that describes the contents of the Target Beauty Box plus a coupon for "$3 off of $15 or more" on beauty, skin, and hair care at Target which is AWESOME for beauty budgetistas like me!! 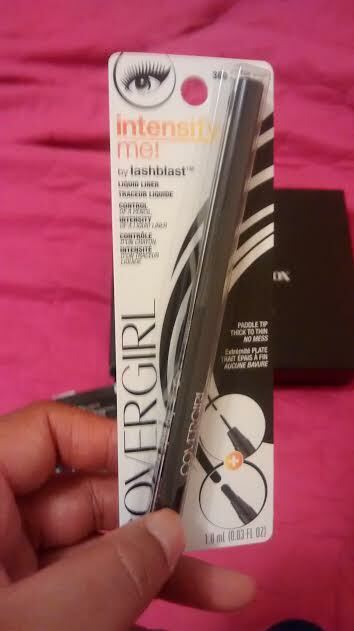 Covergirl Intensify Me Eyeliner 300: Intense black formula glides on smoothly and dries quickly for instant drama. 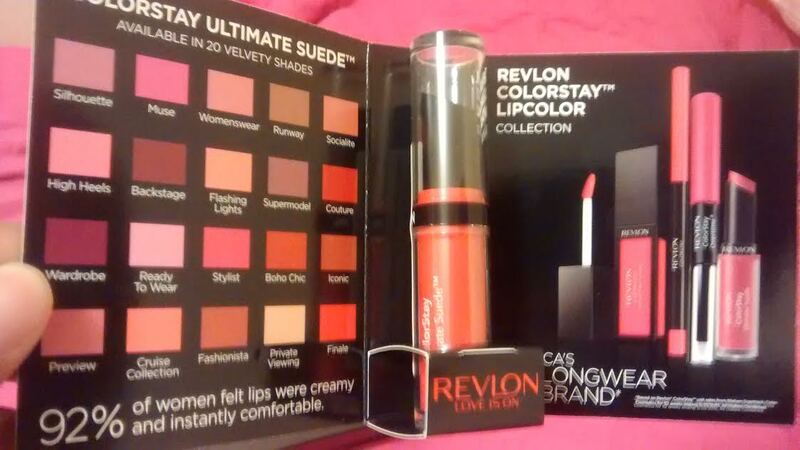 Revlon ColorStay Ultimate Suede Lipstick: Velvty soft formula moisturizes with shea butter and aloe for color that lasts; available in 20 shades. RoC Deep Wrinkle Night Cream: Lightweight retinol treatment hydrates skin cells and helps reduce the appearance of expression lines and deep wrinkles. ACURE Moroccan Argan Oil + Stem Cell Triple Repair Shampoo & Conditioner: Organic argan oil provides moisture for even the most damaged hair, leaving it soft & manageable. Skinfix Ultra Rich Body Butter: Super-rich formula quenches dry, parched skin. Hello Toothpaste: Dye-free, sugar-free paste safely polishes teeth and freshens breath. Olly Beauty Vitamins: An expert blend of antioxidants, vitamins, minerals and collagen that promotes healthy eyes, skin, & hair. S.W.Basics Certified Organic Body Scrub: Gentle exfoliation & deep hydration made from three simple ingredients: sugar, coconut oil & shredded coconut. 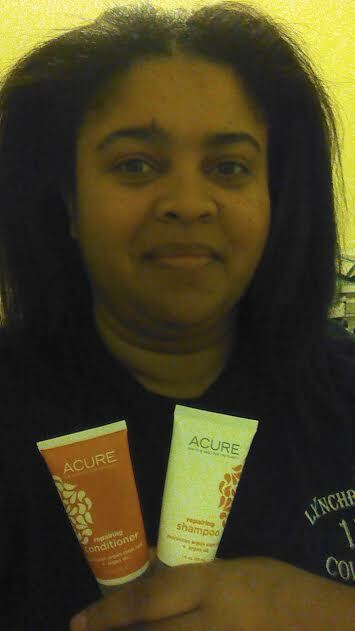 Here is my "before" picture of my hair with Acure Moroccan Argan Oil and Stem Cell Triple Repair Shampoo & Conditioner Travel Size sample for my shower in the morning!! 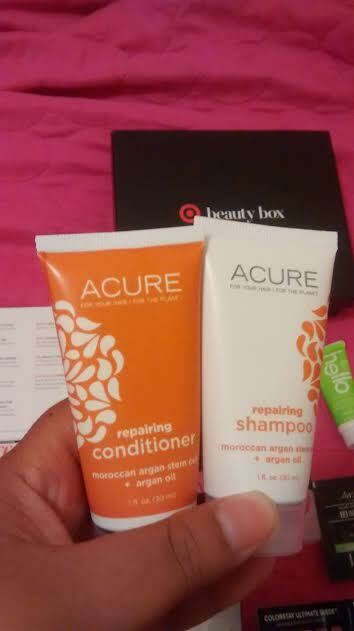 My relaxed hair is due for a touch-up next week, so I am curious how these new hair products will work with my hair!! Details and my "after" pic to come! I can't wait to try this creamy Revlon ColorStay Ultimate Suede Lipstick in which I like the reddish pink color (if you have been following my previous blog posts you know that I am mostly a PINK shade person for most of my lipstick and lip products!). Can't wait to show you with my finished makeup look! 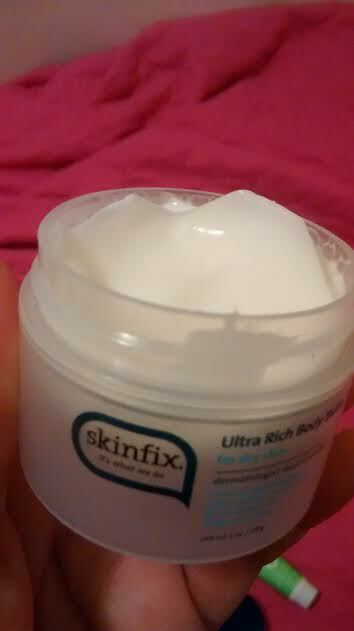 I love the feel and moisture of this skin cream by Skinfix which my dry skin needs for the Fall!! 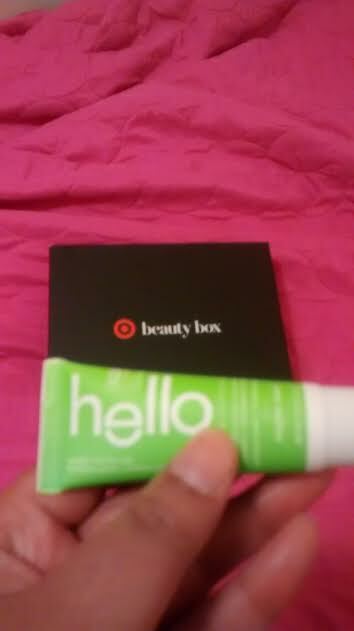 Although its generous travel size sample, I will give it 3 days before its GONE!! Plus, it has shea butter, coconut & sunflower oils!! 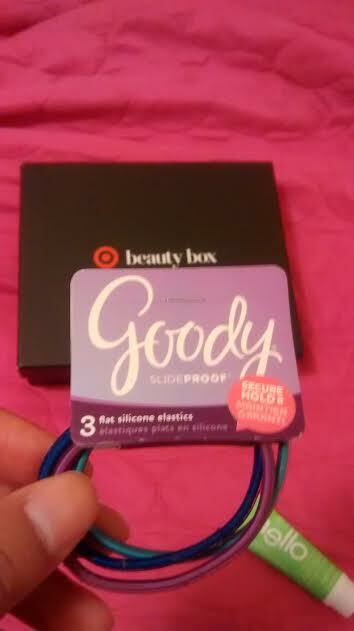 I love Goody hair products esp their Ouchless Elastics for my hair which is prone to breakage due to dryness or poorly made hair piece!! I got so many of these that I can now make a ball out of them but I will use them when I work out or doing chores! This is new to me in receiving Dental care in my Target Beauty Box which I am glad because what goes with a great smile before wearing a lipstick...clean pearly whites, that's what! After breakfast and taking my morning supplements/medications, I brushed my teeth with this mojito mint flavored tooth paste!! 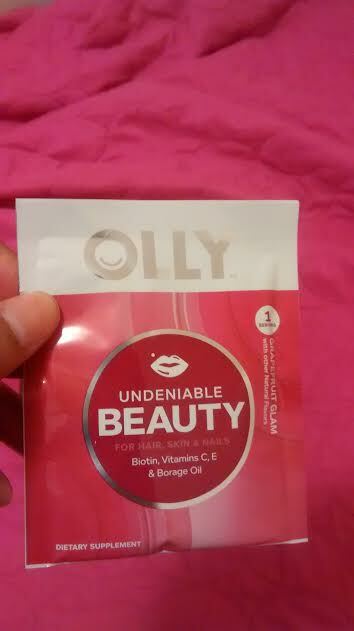 Another first in experiencing an vitamin/nutrition supplement in my Target Beauty Box by Olly Beauty Vitamins!! After breakfast, I chewed on this tropical fruity chew!! I know it takes more than a DAY to review a nutritional supplement but it is a pleasant & fun way for grown ups to take their vitamins! 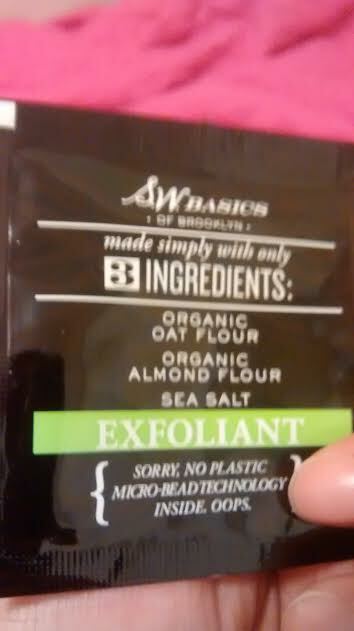 I can't wait to try this organic exfoliant in which I mix with water before applying to my skin!! I love trying organic beauty products that are effective or better than the mass beauty counterparts! I know there is MAJOR difference in what type of scrub I will receive according the Contents Card in which I should have a received a sugar coconut body scrub, but I was glad to try out the facial scrub which contained organic oat flour, almond flour, and sea salt!! The scrub gently removed dirt and dead skin off my face in the shower while waiting to rinse out ACURE conditioner!! Unless you have certain food allergies, I recommend this facial scrub! I am so glad to receive eye make up to re-build my eye makeup collection after 2 months of eye allergy/infection!! Can't wait for my beauty routine in the morning!! 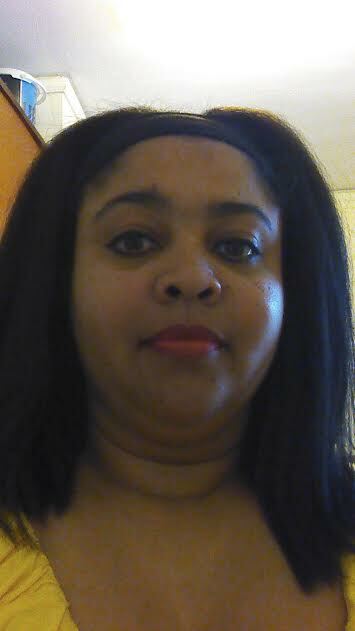 So here is my picture of having my hair and makeup done below and, yes, I know my makeup look is "incomplete" but I want to focus on my eyes and lips with the makeup given to me in my Target Beauty Box! I love the ACURE Argan Shampoo & Conditioner which both had a mild fragrance (it smells like either cherry or almond scent), the shampoo produced moderate suds that didn't strip plus cleansed my hair the first time, and the conditioner left my hair strand with a clean, non-greasey conditioning! I blow dry my hair as usual for the results in this picture below. 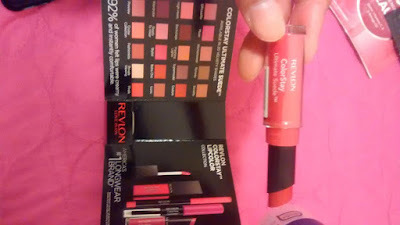 I follow up with wearing Revlon Suede Lipstick in Finale which is very conditioning on my dry lips and I love the black eye liner which I experimented with doing a thick and thin lines around my eyes! 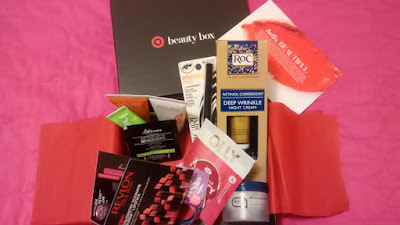 Overall, I totally love this Target Beauty Box for October in which I was able to use all the skincare, haircare, makeup, and health care items!! I highly recommend purchasing this box and wonder what Target will do next for the holidays!! OH MY GOD I want it all. You are so lucky, because here in Spain we dont have this boxes. I did enjoy all of it and glad that I used it in my healthcare, beauty, and hair routine! :) My Mom enjoyed the thick body cream used some on her hands (she works in the warehouse packing/unpacking boxes) and love it!! 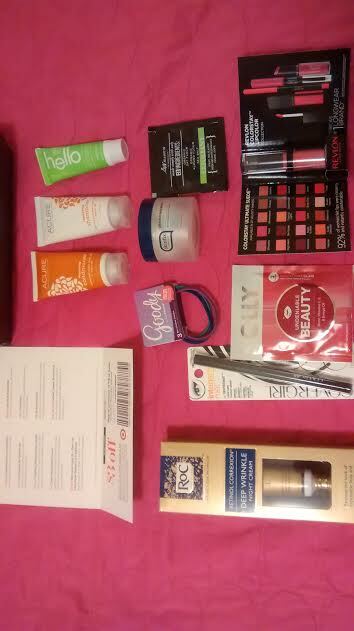 Great box this month with fabulous goodies! Ursula, how do you know when the boxes are coming out? I've missed the last several. Can you sign up for notifications somewhere? Enjoy everything you got. 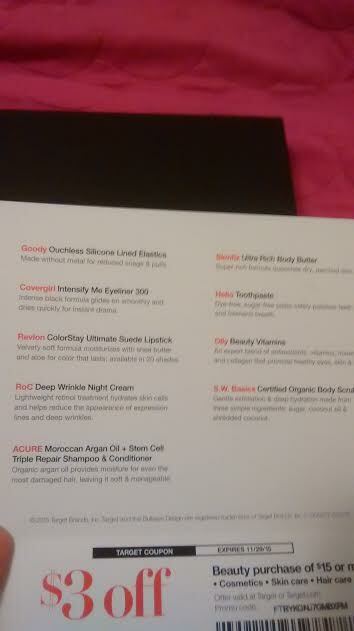 It's definitely an amazing array of products! Personally I don't know myself but I follow the person who knows more about the sign ups than me!! As future career blogger, I need to know HOW myself so let me do some digging and I will share the details with you! Plus, seems like some bloggers don't published how to get this info too! But I will share it with you, Allison and everyone else who is interested!! Thank you, Ursula! I'll see what I can find too. One of my blogger friends said there was some place to sign up on the Target website, but darned if I can find it! Oh wow, I missed this one! Looks like a great box, I like Target's selection! That's a LOT of goodies! I'm a fan of the Acure conditioners for CO-washing. Its not a true sub box like Birchbox which you have to pay monthly $10 BUT you have the choice to buy the box for either $5 to $10 and you know what's in it!! This box has a really good value for just $10 considering all the products you got and it's nice that they included some great natural brands as well. That's a great well rounded box! Love the variety they included. Thank you, Elaine!! I enjoy these Target Boxes!! I love the feel of this lipstick on my lips and perfect for those who suffer dry lips!! No matte for me !! I did!! Normally I don't pink reds in my lipstick choices but I do love Finale plus its conditioning to my dry lips!